A teat and udder balm formulated to penetrate, soothe, and soften chapped and irritated skin. 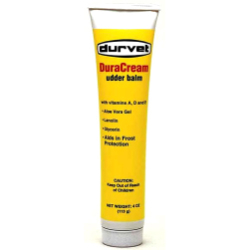 Daily applications of DuraCream help protect teats against the effects of weather extremes: frostbite, low humidity, and warm and cold temperatures. DuraCream is also recommended for use on hands and other skin areas that are exposed to frequent washing and temperature extremes. Creamy cosmetic base provides ease of application. Contains Vitamins A, D, and E. Contains Lanolin for maximum penetration and soothing. Has a pleasant scent for customer appeal. For use on dairy cattle.